LAS VEGAS: One day in 2001, a bright-eyed 22-year-old former World Boxing Council flyweight champion but unknown outside of his native Philippines, walked into trainer Freddie Roach’s Wild Card Boxing Club gym in Hollywood, California looking to fight in the United States. As history would have it, it was where his career and life changed, and boxing history as well. A few months later on June 23, 2001, at the MGM Grand Garden Arena in Las Vegas, Pacquiao challenged then-top junior featherweight world titleholder Lehlo Ledwaba on short notice as a replacement opponent undercard of Oscar De La Hoya's challenge of junior middleweight world champion Javier Castillejo. Ledwaba was the odds on favorite. But Pacquiao, displaying remarkable speed, piston-like pair of hands and with an unorthodox style, destroyed him in six one-sided rounds and on the way to a TKO victory to the shock of those at ringside, including media men as the soon-to-be great tore him apart. Who is this guy was the common question that night. 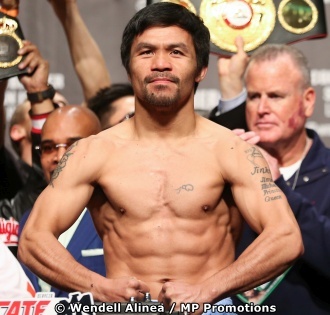 Indeed, Pacquiao's performance was sensational and the launching pad for his legendary career. Pretty soon, Pacuiao himself would answer that question as he went on to become one of the greatest and most loved fighters in the world. He’s the only man to win titles in eight weight divisions, from flyweight to junior middleweight. It could have been 10, had he not skipped the junior bantamweight and bantamweight classes. Pacquiao is the first boxer to win the lineal championship in five different weight divisions and the first fighter in history to win a major title in four of the original eight weight divisions also known as the ”glamour” divisions – flyweight, featherweight, lightweight and welterweight. Paquiao was long-rated the best active boxer in the world pound-for-pound by most sporting news and boxig websites, including ESPN, Sport illustrated, Sporting Life, Yahoo Sports, About.com, BoxRec, and The Ring, starting from his climb to lightweight until his losses at welterweight in 2012. He is also the longest reigning top-ten active boxer on The Ring’s pound-for-pound list. Pacquiao was so unstoppable during his prime from his 2003 demolition of Marco Antonio Barrera in their first fight to earn the lineal featherweight title to his 2012 decision win over Juan Manuel Marquez to retain a welterweight belt in their third fight, drawing comparison to the great Henry Armstrong, who once held world titles in three weight classes at the same time. He fought Marquez four times in epic battles, Barrera twice, Erik Morales and Timothy Bradley Jr. thrice. He dominated Shane Mosley and Antonio Margarito. All of them, except Margarito, were either already in the International Boxing Hall of Fame or likely will be someday. Pacquiao turned 40 last December 17 and remains in the consciousness of boxing fans for more than half of his life. He insists his age is just a number and, in fact, vowed to KO Adrien Broner when they meet on tomorrow, Saturday (Sunday in Manila). He was elected senator in 2016 elections, 18 years since that memorable night against Ledwaba, and still fighting at a high level, with, seemingly, no desire to hang up his gloves even after dancing atop the ring for 462 physically violent and rigorous rounds. Manny Pacquiao and Adrien Broner pose during Friday's weighin. His face off with Broner will be Pacquiao's first fight in the U.S. in more than two years, after seeing action in Australia and Malaysia. He has had such a long and storied career that showed just how great the prime Pacquiao was, how exciting his fights were as he brought immeasurable happiness to fans around the world. The very best of Manny Pacquiao might have already gone but he remains a quality fighter and one of the biggest names in sports. Whatever happens on Saturday in a fight the Pacman is heavily favored to win, by the way -- the end will come eventually. Father Time is -- and always will be -- undefeated. So why don’t we just reflect on the many thrills Pacquiao has given us and appreciate him while he's still fighting, because nothing lasts forever.